ਦੋ ਗੁਰਮੁਖ ਰੂਹਾਂ ਭਾਈ ਸਾਹਿਬ ਭਾਈ ਰਜਿੰਦਰ ਸਿੰਘ ਜੀ (ਚੱਲਦਾ ਵਹੀਰ ਜੱਥਾ) ਅਤੇ ਸੰਤ ਬਾਬਾ ਠਾਕੁਰ ਸਿੰਘ ਜੀ ਭਿੰਡਰਾਂਵਾਲਿਆ ਦੇ ਪਹਿਲੀ ਵਾਲ ਮਿਲਾਪ ਦੇ ਯਾਦਗਾਰੀ ਪਲ. Bhai Rajinder Singh had a very deep respect for all Gursikhs. 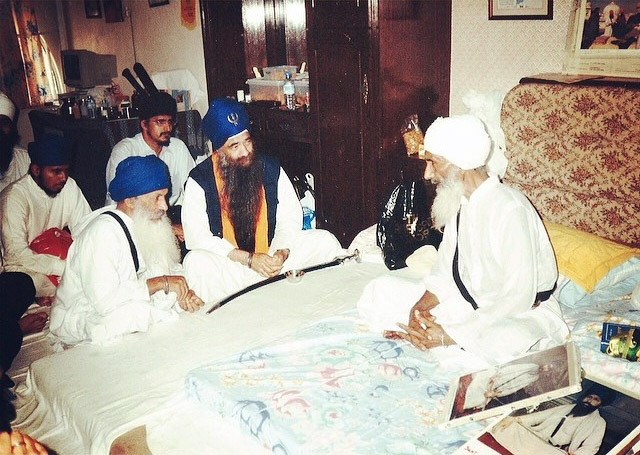 The above photo taken in Malaysia in 1998, when Bhai Rajinder Singh found out that Baba Takhur Singh (Damdami Taksal) was also in Malaysia he requested to meet Baba Ji. When Bhai Sahib entered the room, Baba Ji was sitting on the manji, Baba Ji face instantly lit up & he was delighted to see Bhai Sahib. He instructed the singhs to bring a sheet where they could both sit together, but both of them showed such humility that no one sat on the sheet, they stayed on floor. When I interviewed singhs who were present that day, they told me "they had not seen Baba Ji this happy and talkative". Both of these blessed souls discussed gurmat, sikhi parchaar. Bhai Sahib also asked about Sant Baba Gurbachan Singh Bhindranwale & Sant Kartar Singh Ji. Baba Ji also sent a saropa &sunder gutka for my wedding in 1995 via Giani Pritam Singh (UK). They continued to meet on a number of occasions when Baba Ji travelled to Europe. Great are those who follow the Guru's teaching, may we all be inspired to live such higher spiritual jeewan. 1. When a Gurmukh accepts the teachings of the Guru and becomes like a new born child, he conducts himself innocently & ignorantly in the fear of the Guru. 2. Adopting the teachings of Guru, he becomes Guru's Sikh & grows in wisdom through loving worship. 3. He listens to the Guru's teachings, understands them & lodges them in his consciousness but remains humble in all his wisdom & strength. 4. A Sikh of the Guru serves the other Gursikhs. He bows at their feet & remains engrossed in the true path shown by the Guru. 5. He is ever aware that he is a guest in this world & would be leaving soon. He never forgets the precepts of his Guru. 6. A Gursikh is sweet of conversation, walks humbly & accepts Guru's teachings with heart & soul. 7. A Gursikh earns his livelihood honestly & shares his earnings with others who are in need.